The Kraken is loose! Oh ship, we’re in trouble now! I have a particular fear of what I cannot see, especially in the vast and open murky waters of the deep ocean. Who knows what monsters lurk below? 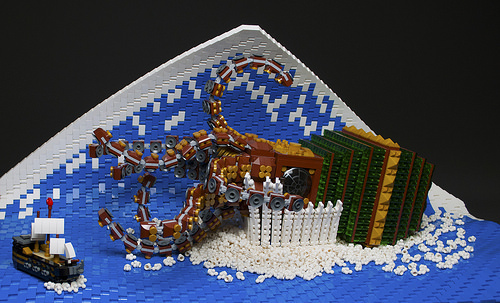 Jason Mario builds an unconventional steampunked Kraken in the middle of a rough open sea. The ripple and foam effects give the scene more life and grandeur of disastrous event about to take place. LEGO has finally released nice, high resolution images of the newest line of the highly-popular Collectible Minifigures, due out in September. They’re technically Series 14, though the LEGO Movie and Simpsons series were unnumbered, making this actually the 17th wave (not counting the rare Olympic series). This time around, the whole line is monster themed, with characters ranging from ghoulish to naughty, and should be widely available just in time for lots of great Halloween creations this year. The Zombie Pirate was getting sick and tired of seeing all of these young whippersnapper pirates mess things up, so he’s come back to show them how things used to be done back in the good old days. Not surprisingly for a several-hundred-year-old sea dog, he’s kind of old-fashioned. He still prefers to strand his prisoners on deserted islands instead of making them walk the plank, and he only plunders gold, not fancy-pants modern treasures like silks and spices. As a zombie, he isn’t particularly big on personal hygiene. 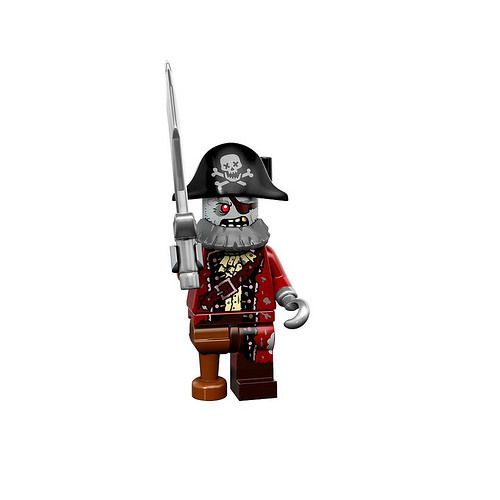 His hook is rusty, his captain’s coat is falling apart, and his wooden leg has a bad case of termites. No one is entirely sure whether he has a beard, or just a particularly impressive collection of moss and lichens on his chin. In good news, he doesn’t smell much worse than the average pirate, and if he falls in the water, he’s more likely to bite the sharks than the other way around!